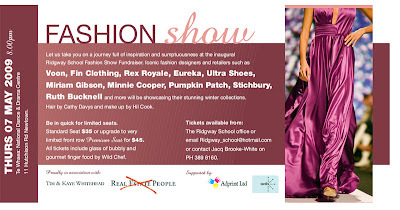 Featuring iconic fashion designers and retailers such as Voon, Fin Clothing, Rex Royale, Eureka, Ultra Shoes, Miriam Gibson, Minnie Cooper, Pumpkin Patch, Stichbury, Ruth Bucknell and more will be showcasing their stunning winter collection. Hair by Cathy Davus and make-up by Hil Cook. It turns out that others have the same dilemma as we have. In one discussion group, somebody suggested going to the Applications Settings page, but through a different route. I tried that, played one game last night, and voila! a notice popped out asking if I want to post this news, then there it was, on my Wall. Instead of going through "Settings" at the top-right menu, click "Profile" at the top left instead. This is located to the right of the "Home" link. Click on "settings" located below the "Share button." At the bottom of the list is "Application Settings". Click on "application settings page." Look for "Scrabble Worldwide" in the list, click on "edit settings" and the pop-up will appear. Make sure "Allow Scrabble Worldwide (excluding U.S. and Canada) to publish ob-line stories automatically, but prompt me for larger stories." Hope that works for you! If it doesn't, don't lose sleep over it :-). In another conversation in Facebook, one person observed that if you are logged in but you open a new tab or window and play Scrabble there, your Scrabble update will not appear on your wall. Also, look out for a yellow triangle with an exclamation point (a warning sign) at the bottom of the Facebook page. If it is there, then your Scrabble news will also not appear on your Wall. Tricky, isnt it? Well... I just finished playing another game where I won but it did not display on my Wall. :-( Help? I have been playing online games since the first Warcraft came out. I have also experienced the thrill of playing online chess in Yahoo! games. And I have been doing social networking ever since the Friendster heyday. 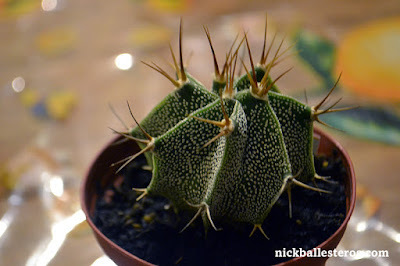 I thought I have passed the gaming and social networking phase, contenting myself with maintaining multiple blogs. However, we have a project at work which involved creating a site for the school alumni, and they wanted something similar to Facebook. And since a lot of them are in Facebook, they would like to have a Facebook interface available there, too. So, in the interest of research I reactivated my dormant Facebook account and played around with it a bit. The most joyous discovery I had here, of course, was that I found my high school batchmates active and alive in Facebook, and I managed to contact them after so many years! My further exploration of Facebook lead me to keeping a pet turtle, sharing drinks, doing quizzes, and commenting on other people's notes. Yep, it can get quite busy at Facebook. My wife also got involved with Facebook. I'm not sure how it happened but there she was, busy connecting with friends and trying out a quiz or two. And then, one day, she started playing Scrabble. And then I played Scrabble too. And then we both got hooked. It's a fairly moderate scoresheet, really. I like a casual game with 5 minutes per turn. I have three wins so far, perhaps it will be you who will be the first ever to beat me! 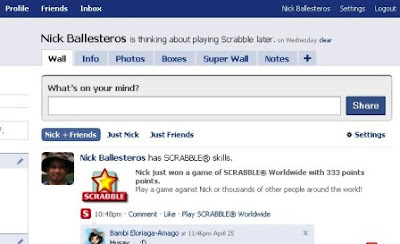 If you have a Facebook account, look mine up (Nick Ballesteros) then link me up as a friend with "scrabble" on the message. I will put you under my scrabble list of friends and then we can play a game some time! 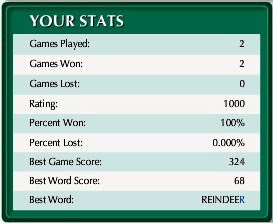 Make sure what you add in your application is the "SCRABBLE® Worldwide (excluding U.S. and Canada)" version. And in case you were wondering... 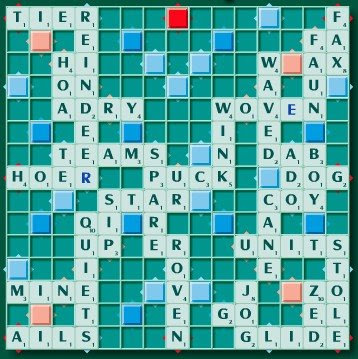 I experienced blogger's block awhile ago and can't think of anything to write... but I had Scrabble in mind so here it is! Now on to the game! 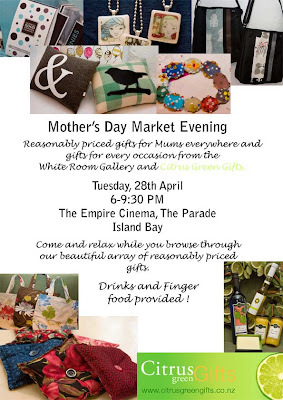 We had so much fun at our inaugural Market Evening last December that the White Room Gallery and Citrus Green Gifts are delighted to join forces once again to invite you and your friends to our 2nd Market Evening to be held at the Empire Cinema, Island Bay on Tuesday, 28 April from 6pm-9.30pm. We've selected the date to coincide with shopping for Mother's Day , whether it be for your Mum or yourself, but there are always ongoing birthdays to buy for, functions to attend, thank you gifts to find at a moment's notice - so please come along and see our huge range of gifts and products that we have sourced especially for you, all at very reasonable prices! From beautiful handmade bags, tea cosies ,oven mitts and stationery to gift boxes of delicious food items, gorgeous household decorations, funky jewellery, local artwork, quirky accessories- we have something for everyone. We also have environmentally friendly products and we are happy to mix and match gifts into a gift wrapped package. And because we want you to relax and have fun, we are offering drinks and a selection of finger food while you browse! It would also be a great opportunity for you to meet my new business partner at Citrus Green Gifts, Anne Gibson. So pop in for ten minutes or stay for two hours- we'd love to see you. And you'll love our range of innovative, reasonably priced gifts..we guarantee it! The Wellington City Libraries has a new service for its members. Newspapers online! But what's new about it, you may ask, since newspapers have their own website anyways? Well, this is a rather different approach to an already familiar concept. Instead of being presented with news items categorized into links and sections akin to a website, you are presented with the same look as the newspaper you would have bought from the newsstand! Same layout, same advertisements, same favorite cartoon strips, same job board... all this without cutting down trees! 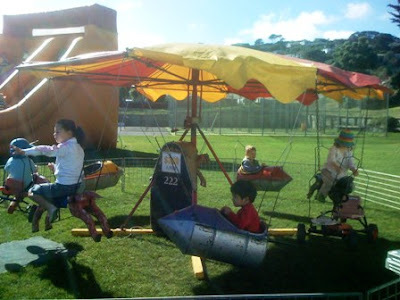 It's technology made possible by PressDisplay, and your subscription is made available by the Wellington City Council. All you need is a computer with an internet access and your library account number to access not only a handful, but more than 300 newspapers all over the world! I am also excited by the fact that we can access some newspapers from the Philippines, namely Philippine Daily Inquirer, Manila Times, and Asian Wall Street Journal! This news service literally puts information right at your fingertips. Ready to learn how to do this? Get your library card ready and read on! 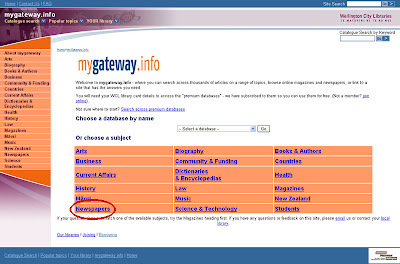 This takes you to mygateway.info. Click on "Newspapers" at the bottom left corner of the table. You will be presented with a list of services, but what we are interested in right now is PressDisplay, which is at the top of the list. Click on "Start search". You will then see this prompt for your Library Card No. and your Last Name. Your Card No. is located at the back of your Library card, and starts with a C and followed by a series of numbers. Now, when you type in your number, make sure you start it with a small letter "c". For some reason, a capital letter "C" does not work. Type in your Last Name in the space provided for, then click the "Enter Database" button. If you typed in your correct details, you will be redirected to the PressDisplay site. Now, to choose your newspaper, you have two options: scroll to the country of your choice at the left hand side menu, or you may select by country, by language, or alphabetically at the upper right menu. The cool thing is the menu system remembers newspapers you have seen previously and keeps a list of that in the upper right menu for convenience. - if you want to flip to the next page, point your mouse to the lower right edge of the page. The page will appear to "lift" at the edge. Click this and the page will move, just like a regular newspaper! To go back to a previous page, click on the lower left edge. - some papers, like The Dominion Post, has its main sections listed beside it. That makes it easy to jump through areas. - when you want to read a news item on a page, point on that section and that area will be highlighted. Click once and that section will zoom in. Double click on it and the page will zoom out to show the entire page again. If you click on the title of the article instead, you will be shown a "pop-up" screen with the news item in it and a commenting pane at the end, much like a blog post. You can even give the thumbs up sign if you like the way the article was written! - when a news item gets highlighted, other buttons appear with it. You may (from left to right) share, print, listen, comment. I am not sure how the "listen" option works (having tried it but nothing happened) but the others are quite self-explanatory. And when you're done, don't forget to log out at the upper right hand menu. Give PressDisplay a whirl and look at newspapers in a whole new light! Visit Catholic Online for the season's messsages. 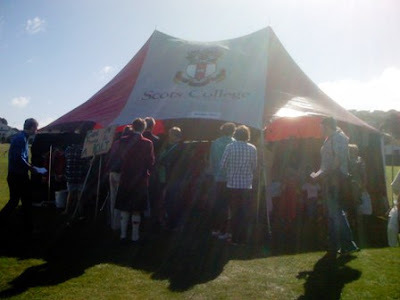 The final Sunday of March saw us at the Scots College grounds for their highly-anticipated Gala. This being our first time to participate in such an activity, we did not know what to expect. But when the bus was approaching the school, we saw cars parked on both sides of the road! The usually quiet roads were filled with cars. This is indeed, an anticipated event. There was lots of things to do at the Gala. For one thing, there was a lot of items on sale: pre-loved clothing, toys, furniture. There was an assortment of plants, and a huge tent was occupied by food stalls serving a wide variety of cuisine from different continents! 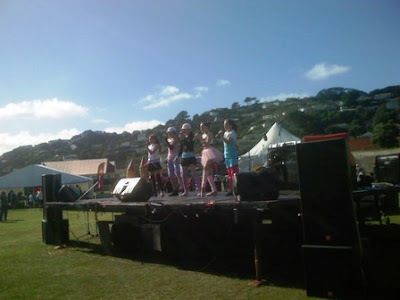 Jo-Lo had loads of fun with the kiddie rides and shows on stage. It was a fun, family-oriented activity! The ladies were lining up at the clothing tent. That place was busy for most of the day. The crowd was entertained by intermission numbers and contests. 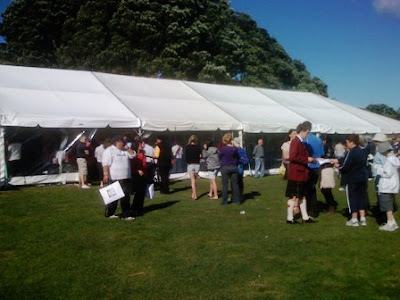 The Gala is a fundraising activity, the proceeds of which go to the further development of Scots College. And as an extension to this activity is the online auction of quality items, some appealing to collectors. 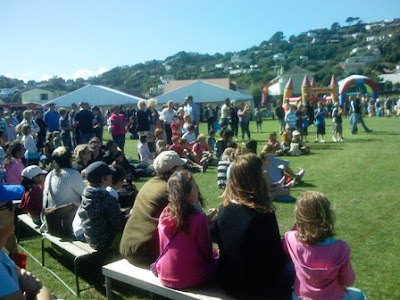 You might find something you fancy at the auction being hosted by Trademe. 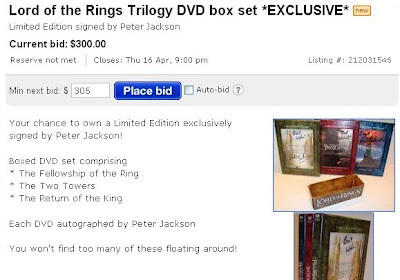 So head on there and bid! Daylight Saving Time (DST) officially ends today. This is the day we take back the time we "lost" when DST started late last year. But for us, it was not as simple as that unfortunately. We got all confused... should we wind back our time to an hour back, or an hour forward? When things are bound to go wrong, things will go wrong. Some dude called Murphy said that, and he's right. We turned back our clocks to an hour, and we ended waking up at 7:00 this morning but it was still pitch black outside! We checked the computer time but we were really dubious about this because a Windows fault has reset the DST at least a couple of weeks in advance so we felt we couldn't rely on it, even with Google search. 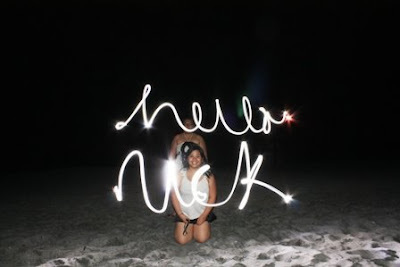 What better way to spend Earth Hour than by a pristine beach far from civilization, under the bright stars? That's exactly what my trekking buddies did. We were in Camiguin Island last year, and now they went to Anawangin Cove in Zambales, the Philippines. And they sent me this greeting from across the miles.